Director – Edward L. Cahn, Screenplay – Curt Siodmak, Photography (b&w) – Fred Jackman, Music – Mischa Bakaleinikoff, Special Effects – Jack Erickson, Art Direction – Paul Palmentola. Production Company – Clover Productions. 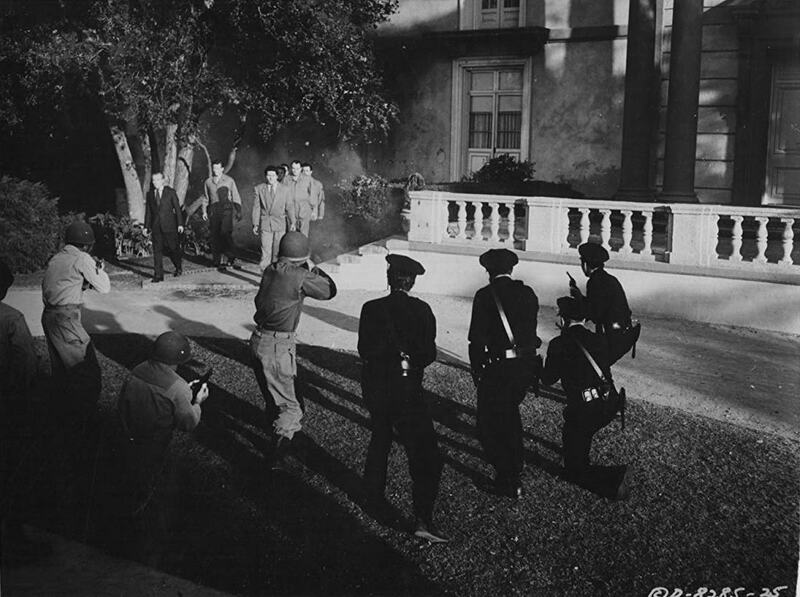 A man breaks in and attacks the crime kingpin Hennessy, proving impervious to the bullets shot at him. Crime lab doctor Chet Walker investigates this and the subsequent killing of District Attorney McGraw in an identical manner. Chet is puzzled to find glowing, radioactive fingerprints found at either scene. In his investigation, Chet discovers that deported crimelord Frank Buchanan has returned to the country accompanied by German scientist Wilhelm Steigg. Steigg has perfected a process using atomic energy that allows him to resurrect the dead and take control of their minds, turning them into zombies. Buchanan is now using the zombies to exact revenge against those who were responsible for condemning him. 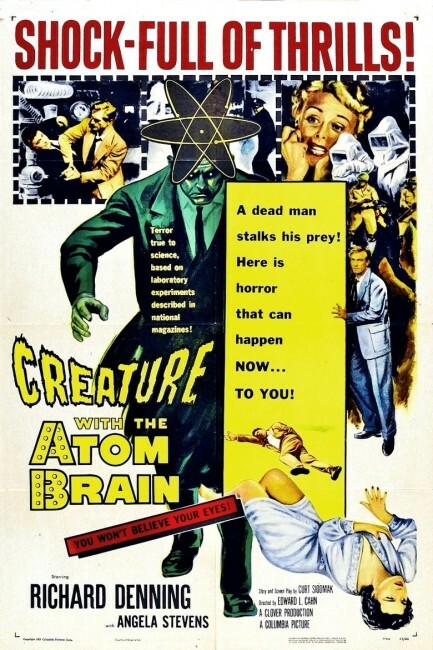 Creature with the Atom Brain was a B-budget film of the 1950s. It was produced by an uncredited Sam Katzman, a B-budget specialist who was prolific with assorted Bela Lugosi horror films and East Side Kids comedies during the previous decade. Through his Clover Productions company, Katzman made a number of films of the era including It Came from Beneath the Sea (1955), The Werewolf (1956) and Earth Vs the Flying Saucers (1956). The film had a script by German emigre Curt Siodmak who found a career making Hollywood B movies (see below) and the show was placed in the directorial hands of Edward L. Cahn who had made numerous B genre films (see below also). The dropping of the atomic bomb in 1945 and all the fear and anxiety that came with it made ‘atomic’ into one of the buzzwords of the 1950s. The Beast from 20,000 Fathoms (1953) created the first atomic monster movie and soon after atomic radiation became the catch-all explanation of the decade when it came to devising rationales for monsters. Indeed, Sam Katman and Clover had ventured into the atomic monster movie before with It Came from Beneath the Sea about an atomically enlarged octopus and subsequently made the first and only atomic werewolf film with The WereWolf. In actuality though, take away the word atomic from the title and all that we have is a mad scientist film that would have been regularly churned out by Katzman at one of the poverty row studios during the 1940s. Creature with the Atom Brain is efficiently made, although the low-budget gets in the way of making a terribly interesting film. This means that the action is curtailed, resulting in a film that consists mostly of static talk scenes. The mind-controlled atomic zombies, for instance, are never allowed to do much more than kill a couple of people up until the climactic shootout that takes place on the mad scientist’s front lawn. Edward L. Cahn at least keeps the talkiness moving with a snappy pace, while Curt Siodmak writes the scientific doublespeak in a way that almost sounds halfway convincing. Edward L. Cahn was a regular director of B movies during this era, including the likes of:- The She-Creature (1956), Invasion of the Saucer Men (1957), Voodoo Woman (1957), Zombies of Mora Tau (1957), The Curse of the Faceless Man (1958), It! The Terror from Beyond Space (1958), The Four Skulls of Jonathan Drake (1959), Invisible Invaders (1959) and Beauty and the Beast (1961). Curt Siodmak’s other genre scripts include:- F.P.1 Does Not Answer (1932), Trans-Atlantic Tunnel (1935), The Ape (1940), Black Friday (1940), The Invisible Man Returns (1940), The Invisible Woman (1940), The Wolf Man (1941), Invisible Agent (1942), Frankenstein Meets the Wolf Man (1943), I Walked with a Zombie (1943), Son of Dracula (1943), The Climax (1944), House of Frankenstein (1944), The Beast with Five Fingers (1946), Tarzan’s Magic Fountain (1949), Riders to the Stars (1954) and Earth Vs the Flying Saucers (1956). Siodmak also directed/wrote several films with Bride of the Gorilla (1951), The Magnetic Monster (1953), Curucu, Beast of the Amazon (1956) and Love Slaves of the Amazon (1957). Siodmak also wrote the classic novel Donovan’s Brain (1942) about a millionaire’s disembodied brain that ends up mentally controlling the scientist that removed it, which has been thrice filmed as The Lady and the Monster (1944), Donovan’s Brain (1953) and Vengeance/The Brain (1962). Siodmak’s lesser known follow-up Hauser’s Memory (1968) about transplanted memories was also filmed as the tv movie Hauser’s Memory (1970).